Continuing our Best of 2017 coverage, counting down the best that the year had to offer in film, we have arrived at our favorite performances. 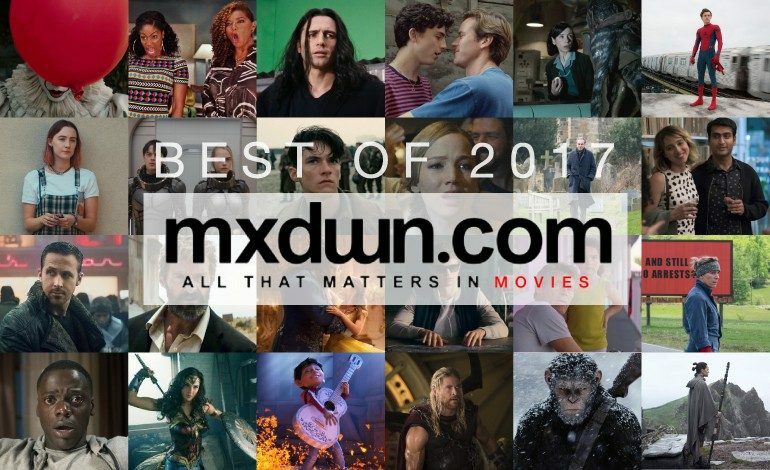 Our picks at mxdwn vary from clear award contenders to surprising and impressive turnouts from veterans and newcomers alike. What follows are the performances that captured our notice this year and brought their respective films to new levels. Of the romance in Call Me By Your Name, the subtle emotional cues of passion and heartbreak are carried out with precision by Timothée Chalamet. Although his seventeen-year-old character Elio blatantly points out that Armie Hammer’s Oliver is “confident,” it is the inner resolve, youthful abandon, a strong emotional vulnerability from Elio that skyrockets the film’s central romance. Chalamet plays out a gentle giant of emotion and takes Luca Guadagnino’s film to depths it may never have reached otherwise. In what could have easily become a stale impersonation, James Franco somehow transformed his portrayal of tortured director of The Room Tommy Wiseau into a career-defining performance. He’s at times sympathetic (and at times a selfish monster) while always being singularly motivated by his passion to make a movie. Like Johnny Depp’s depiction of Ed Wood, Franco has captured the mania of a man determined to make his mark on Hollywood. The Disaster Artist could’ve been a cheap shot to mock a director who made a truly awful film; instead James Franco shoots for the stars and delivers one heck of a performance. The laugh, the look – it’s all there and it plays beautifully. Franco has been funny before, but this role is something entirely different from anything he’s done before. Bravo Mr. Franco. In her first solo big screen feature, Gal Gadot brings Wonder Woman to life brilliantly, making us wish that Warner Bros. and DC would make greater use of her in their struggling superhero universe. Gadot leans away from the dark, moody performances of franchise costars Ben Affleck and Henry Cavill to deliver us an honest, optimistic, intelligent and idealistic hero in Diana of Themyscira. Seeing Gadot learn the ways of the world and bravely face the horrors of World War I as a fearless Amazon warrior is impressive enough, but watching the actress reveal Diana’s vulnerable, sensitive side without weakening her strength as a character is an even more masterful feat. This is the ‘Wonder Woman’ we deserve, and Gadot’s performance should serve as a lesson to all other superhero actors. Gal Gadot was exceptional in her role of Diana Prince, she really captured the essence of the tv show and delivered a powerful performance. Sally Hawkins, in her portrayal of the mute Elisa Esposito, carried The Shape of Water with her performance. Her expressions and gestures carry as much weight as an Arthur Miller monologue. While surrounded by heavyweights like Octavia Spencer, Richard Jenkins, and Michael Shannon, Hawkins held her own and owned the heart-achingly romantic role. Sally Hawkins, never disappointing, rises up to the challenge of displaying the full gamut of human emotion — loneliness, affection, curiosity, sympathy, desire, anger, despair, satisfaction, glee, joy, rapture, gut-wrenching heartbreak – all without words. I think we have found our new Spider-Man. Many actors have portrayed the titular hero, but none have pulled it off better than Tom Holland. Holland brings a breath of fresh air for the character with a more comedic take, something that the previous films attempted to imitate with varying levels of success. I hope to see more of Holland in future films and I am excited to see how he performs in other roles. Hugh Jackman turns in his most powerful performance as the lone wolf X-Man Wolverine. Jackman has lived in the role for 17 years, and every moment of that time is written in the lines on his face and heard in the sharpness of the breaths he draws after finishing each of the film’s brutal fight scenes. At last, Jackman reveals the tenderness that Logan has all but refused to show us through the X-Men film series, bringing the father/son relationship between his character and Patrick Stewart’s Charles Xavier to a satisfying conclusion. At the same time, Jackman shows us the challenges of growing old and facing mortality after watching friends and family gradually slip away. It’s one of the finest send-offs to a beloved character I’ve ever seen. Since 2000, Hugh Jackman’s Wolverine remains one of the best casting decisions for a comic book character on the big screen. Sure, it ultimately resulted in the X-Men films placing Wolverine above its entire cast, but you’d struggle to find anyone who didn’t love watching his character in action. Yet, for his final outing, Logan sees Jackson at his finest, delivering a performance that likely won’t be nominated for an Academy Award but deserves it nevertheless. This Logan is tired, broken, and even gruffer than in his original debut, slowly dying from Adamantium poisoning and forced to pull one last job before his time runs out. He’s also the bloody, ‘Berserker Rage’ Wolverine fans had been dying to see for years, slashing up foes with his claws in a manner that truly earned that hard R-rating. It’s a swan song performance that matches Logan as not only Marvel’s best film to date, but also the closest it has ever come to matching DC’s The Dark Knight. Hugh Jackman was breath-taking in Logan. He gave such a heart-wrenching performance, bringing strength and vulnerability to his role. However, I should note that the entire cast of the film was also amazing, and they all played off of each other to create a fascinating and enthralling film. Daniel Kaluuya was such an amazing lead. Throughout the film, you could fully sense his emotion and what he was thinking just from his actions and expression, which helped anchor audiences even more into the film, which is enthralling. His performance was generous and fantastic. In Germany’s Oscar contender In the Fade, Diane Kruger portrays a woman on the edge of grief. Forced to face the people who allegedly killed her family, the wide range of emotion and quiet decision-making done by Kruger presents a woman also on the edge of humanity and an understanding of her place in the world. A film that on the surface tells a story of grief, justice, and revenge, is so much more through Kruger’s vulnerable resolve and determination throughout the film. She is a mother the entire time, even when her family is lost to her. McDormand’s career defining performance is a flawless portrayal of anger and grief. Mildred is a is one of the best realized characters in recent history. It’s a performance that will be studied and revered for years to come. Best known from his role on HBO’s Silicon Valley, Kumail Nanjiani wowed this year with his autobiographical film The Big Sick. While stand-up comedy may be his usual forum, here Nanjiani brings the heart, levity and sincerity needed to make his part in this true story come to life. It’s not just a great comedy film, it’s a great movie all in all, and much of it truly comes from Nanjiani’s performance. Gary Oldman’s performance in Darkest Hour is not a show of great acting, it’s a embodiment of a historical figure. he commands the screen with panache and fuels every scene in the film. His words flow so smoothly and even his movements seem perfectly executed making his performance not only memorable but one of his career’s best. Once again–as was with his performance in The Hurt Locker—Jeremy Renner has delivered a career-best effort in Taylor Sheridan’s Wind River. Here, a long saddened tracker of vicious wild animals is thrust into the effort to find out what caused a local teenager to run wildly into the snow. Renner finds the soul of the character, effortlessly portraying the flawless manhood, unfailing decency and bent for justice that it absolutely needed. The complexity of Rockwell’s performance is an understatement. What the audience is privileged to see is a true transformative progress–a characterization that is seldom seen in such finely tuned parameters. What begins as a cantankerous, racist numbskull soon morphs into an upstanding man that, while continuously flawed, is fighting for what is right and what is left decent in this (or rather his) world. We cringe, we laugh, we drop our jaws to the floor. And yet, we also sympathize, and even come to admire the flawed Jason Dixon. It’s a character evolution that Sam Rockwell embodies like few others, breathing life into what many would have turned into a sordid stereotype of classless buffoonery. Here’s to hoping that the powers that be recognize Rockwell’s brilliance come award season too. Saoirse Ronan absolutely blew her role out of the park. She played the angsty teenager trying to discover herself in such a way that it is almost impossible not to sympathize with her. The amount of emotion put into her performance allowed her to shine in this role. Is there nothing that this actress cannot do? So different from her luminous Irish character Eilis in 2015’s Brooklyn, Miss Ronan as Lady Bird fully inhabits the body of an awkward American teenager so remarkably well it’s hard to believe this is the same actress. More than anything else, Saoirse Ronan’s portrayal of Christine “Lady Bird” McPherson feels genuine in terms of performance and character quirks. She is simultaneously wise in her teenage angst and naïve towards how the world works, an outlook that many viewers can identify with in some way or another. It’s a very millennial outlook, but one that manages to feel original without ever falling into the tropes or clichés that have doomed other films of this genre. Just as Lady Bird the film never comes across as a John Hughes knock-off, neither does Lady Bird the character feel like a rehash of characters that try to act the way teenagers do. Instead, she simply acts like a teenager. Stanton’s last role is not just one of his few starring roles but also one of the best performances of the year. As a curmudgeonly old man begrudgingly forced to consider his own mortality, Stanton gives us a heartfelt, real performance that wisely avoids pat answers or easy emotions. It’s a showcase and great send off for an all-time great character actor. Years after – well decades after – Vince Vaughn‘s fast talking comedic shtick has run dry, the Swingers actor is rebuilding himself in a more dramatic mold, and actually succeeding at it (True Detective Season 2, Hacksaw Ridge). Brawl in Cell Block 99 – from S. Craig Zahler (Bone Tomahawk) – gives us Vaughn as we’ve never seen him. As a hulking brute forced to fight in prison to save his wife and unborn child, he is filled with rage and purpose yet remaining sympathetic regardless of how violent he must get. Emma Watson was stunning as she portrayed the beloved character of Belle. Though her voice was significantly different then the original, she brought back a tale as old as time for an all new audience.